BEETHOVEN Piano Trio No. 5 in D major, Op. 70, No. 1, "Ghost"
At the time this recording was made, cellist Maurice Eisenberg must have felt like an old man, though aged just 36. Alongside him were the brother and sister prodigies Yehudi and Hephzibah Menuhin, then just 19 and 15 respectively - their combined ages less than his. Maurice Eisenberg was born on 24th February 1900 in Königsberg (now Kaliningrad, Russia, then capital of East Prussia), of Polish parents, moving to the USA at the age of two. Clearly a talented child, he was, by the age of eighteen, principal cellist of the New York Symphony Orchestra, having already played with the Philadelphia Orchestra. In 1921 he met and played for legendary cellist Pablo Casals, then on tour in the United States. The meeting was a turning point for Eisenberg - it prompted a return to Europe in 1922 for further advanced training under Klengel, Becker, Boulanger, Alexanian and Casals, his most important mentor and ultimately, lifelong friend. Between 1926 and 1939, Eisenberg played and taught in Europe, gaining a reputation both for his interpretation of Bach and also much music of the twentieth century. He played with the Menuhin Trio, also recording the Tchaikovsky Piano Trio in A minor, Op. 50, over the two days immediately before this present recording was made. He founded and was director of the London International Violoncello Centre, and taught at the Ecole Normale de Musique in Paris, the Longy School of Music in Cambridge, Mass., towards the end of his life, the International Summer Courses in Casals, Portugal. By the time of his death in 1972 he was Professor of Cello at Juilliard School of Music, New York. 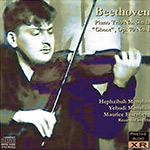 Menuhin is luckily partnered by his pianist-sister, Hepzibah, of whose playing I have always been quite fond. Cellist Eisenberg was an excellent musician and a fine chamber player. In the famed second movement of the “Ghost” Trio, the three of them almost share the same mind regarding the music. I no longer hear them as three musicians coming together, but as one mind playing three instruments simultaneously.